Cat on a Hot Tin Roof ('58) Intro. 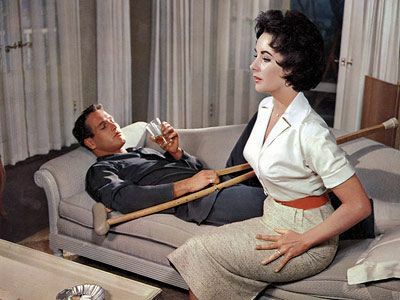 Cat on a Hot Tin Roof was released by MGM on August 27th, 1958 & stars Paul Newman, as alcoholic ex-football star Brick Pollitt, & Elizabeth Taylor as his desperate wife Maggie, ie Maggie the Cat. The film was released just 3 & a half years after Tennessee Williams’ play debuted on Broadway. Initially, there were difficulties in adapting Williams’ frank story of repression, self-loathing & family disfunction for the screen, where even in the late ‘50’s the Production Code still dictated what was suitable for public consumption. Brick’s bi-sexuality & Maggie’s carnal desires, for instance, needed to be muted or masked to get past censors. Within this struggle, however, producers looked at actresses as diverse as Eva Marie Saint & Lana Turner for the role of Maggie before choosing Taylor in a career defining role. Similarly, the role of Brick was not easily cast & Newman was finally chosen once Taylor insisted she would quit if Brick wasn’t chosen quickly. 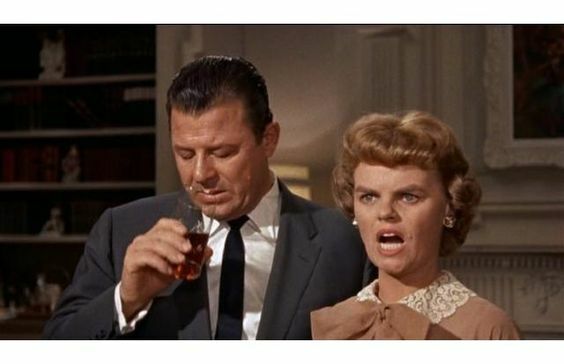 The rest of the cast was filled out by 2 stage holdovers, Burl Ives & Madeline Sherwood, who had created the parts of Big Daddy & Sister Woman, respectively, the always dependable Jack Carson as Gooper & Judith Anderson as Big Mama. ​Filming began in March of ’58 & came at a time of great opportunity for both Newman & Taylor. Newman had 3 flops among his 5 screen credits (Silver Chalice, Left Handed Gun & The Helen Morgan Story), while Taylor was still struggling to achieve consistency in her adult roles, having made her film debut 15 years earlier at age 9. Personally, both stars were riding high, with Newman having married 2nd wife Joanne Woodward in January & Taylor happily married to 3rd husband Mike Todd. When production began, however, Taylor contracted a viral infection that kept her off the set for several days & forced her to cancel a trip with her husband to New York where he was to receive an award. On March 22nd, En route to New York, Todd’s plane, The Lucky Liz, crashed, killing all 4 on board. Taylor, beside herself with grief, remained off the set for several weeks & the filming was nearly cancelled. Director Richard Brooks kept the studio at bay be rearranging the shooting schedule to accommodate Taylor’s absence. Once shooting resumed Newman’s & Taylor’s on-screen chemistry was apparent to everyone on set, although Newman never understand how Taylor could go from being a blank slate in rehearsals to a full on tour de force once the cameras rolled. His ‘Method acting,’ born of his work on the New York stage & with the famed Actor’s Studio, had him honing his performance as he teased out emotions & motivations subtly over repeated practices. Eventually they meshed & although it was the only time the two would star together in a film, it’s apparent that they were well matched. ​The film opened to strong critical & commercial success & was the second highest grossing film of the year (South Pacific #1) with $25.1M in domestic box office (adjusted would be $375M). Playwright Tennessee Williams was not a fan, however, as he took umbridge not just with Brooks & Poe’s significant changes to the 3rd act, but with the muting & near elimination of Brick’s homosexuality. In commenting on the film Williams merely pointed out that “you shouldn’t go see it. It will likely set the business back 50 years.” Clearly Williams didn’t blame Newman for the film because Newman went back to work in Williams new play Sweet Bird of Youth & would later star in the film adaptation. 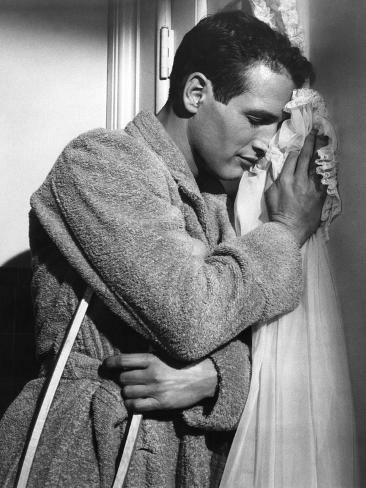 For Cat on a Hot Tin Roof Newman was paid $17,000, his highest salary at the time. 4 years later, when the film of Sweet Bird went into production his salary was $350,000. Film critics, on the other hand were effusive in their praise for Newman & Taylor’s performances. Later, the film would earn 6 Oscar nominations including both lead actors & best picture. 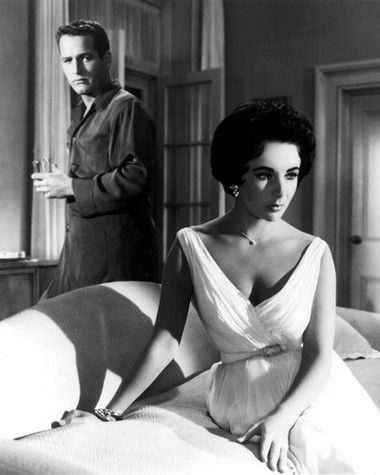 Unfortunately, Cat on a Hot Tin Roof didn’t win anything on Oscar night as Gigi took 9 awards & David Nivens (Separate Tables) & Susan Hayward (I Want to Live) won the major acting awards. Both director Brooks & Taylor would win Oscars in 1961 for Elmer Gantry & Butterfield 8 respectively. While Newman was nominated for an Oscar 9 more times he didn’t receive his first competitive award until 1987’s The Color of Money. 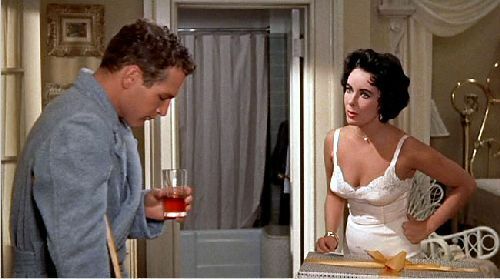 Along with The Long Hot Summer, Cat on a Hot Tin Roof helped launch Newman the actor, but more importantly it launched Newman the icon & within the next decade he would make The Hustler, Hud, Hombre & Cool Hand Luke, establishing himself as one of the great actor/movie stars of the 60’s and beyond.